Autonomous Emergency Braking (AEB) is a collision avoidance feature that integrates state-of-the-art driver assistance systems with Electronic Stability Control (ESC). 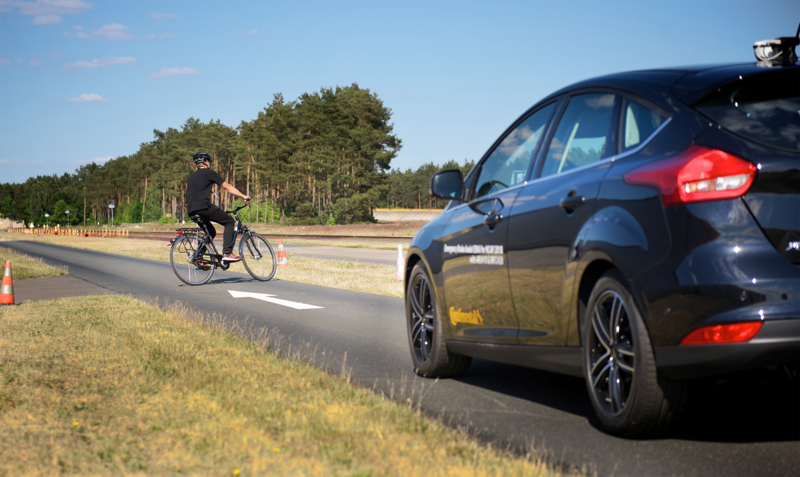 Autonomous Emergency Braking is a proactive and predictive driver assistance system that provides emergency braking assistance – or can even brake autonomously – if an accident risk is detected. This intelligent system aims to avoid collisions with all types of obstacle. Alternatively, if an accident is unavoidable, the system targets maximum reduction of the impact speed. AEB systems use a network of sensors to continuously monitor and evaluate basic operating and driving conditions such as speed, acceleration and proximity to obstacles, along with brake pedal position and steering angle. The sensors can detect, say, if the vehicle is starting to close up on a vehicle in front. The detected speed and proximity data is used by an onboard computer to calculate when the driver would need to react in order to prevent a collision. If the driver has not responded appropriately by that time, for example by lifting off the accelerator or braking, the system takes appropriate action automatically. Experts estimate that fitting vehicles with state-of-the-art AEB systems could cut road accident injuries by approximately 35 percent. Brake Assist (BAS) in its simplest form was first introduced in Germany in 1996. Forward Collision Warning (FCW), by contrast, detects speed differences and proximity, and warns the driver of a collision risk by means of audible and visual signals. It does not, however, actively intervene in the driving process. So a collision can only be avoided if the driver responds to the warning by taking timely and appropriate action. In more advanced systems, this forward collision warning is combined with a brake assist system featuring additional sensors. By monitoring these sensors, the system is able to evaluate the driver’s behavior and provide intelligent assistance. For example, by monitoring pedal sensors, a combined FCW/BAS system can identify a sudden switch from the accelerator to the brake pedal – a characteristic sign that the driver intends to respond to an accident risk by emergency braking. In such a situation the system is capable of immediately generating full braking pressure for maximum deceleration. 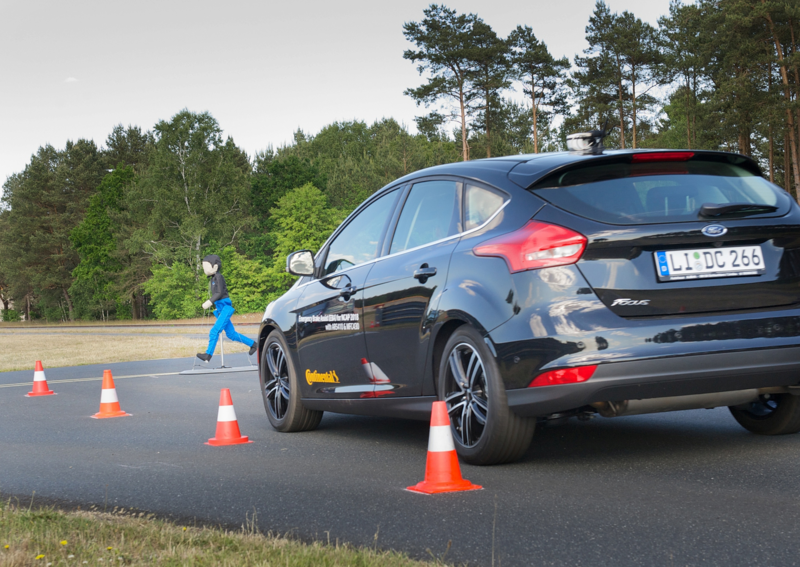 An Autonomous Emergency Braking system goes one step further. Its environmental sensors detect critical situations in good time, and the system then takes accident avoidance measures automatically. Driver reaction is not essential in such cases – but neither is it ruled out. The driver can reassert control at any time. In Europe, the first such system was introduced in the Mercedes-Benz S-Class in 2006. It was radar-based and featured a multi-stage warning and intervention strategy. 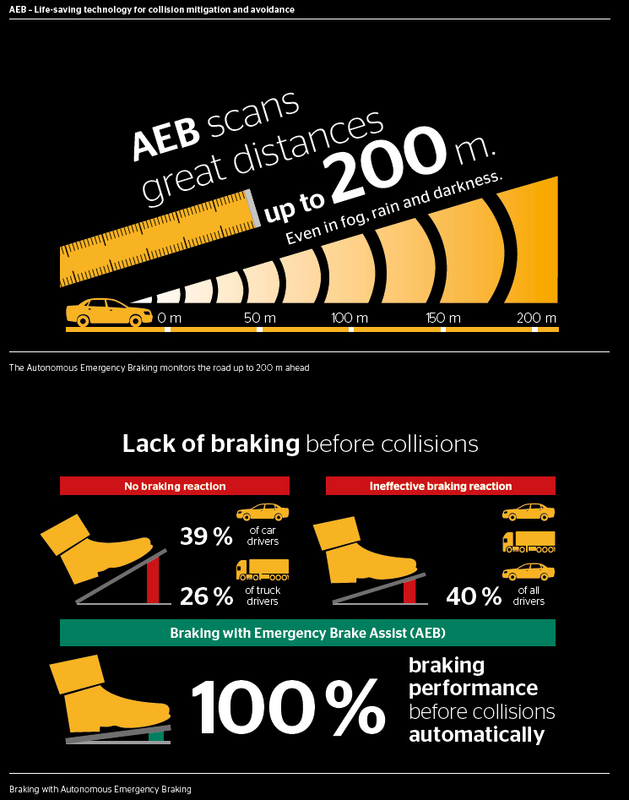 Autonomous Emergency Braking systems are always proactive and predictive. If a collision risk is detected, the system brakes automatically, thereby reducing the speed of the vehicle. Finally, when the computed distance from a vehicle in front falls below a critical level, the system initiates full-force emergency braking. These autonomous systems use lidar sensors, cameras and/or precision radar sensors. Autonomous Emergency Braking systems come in three different types, distinguished by their applications: “pedestrian”, “city” and “inter-urban” (for out-of-town driving on motorways and major roads). The algorithms of city AEB systems are adapted to dense traffic conditions, frequent braking and acceleration and roundabouts, while inter-urban systems are adapted to the higher speeds and longer safety margins on motorways and major roads. Pedestrian AEB systems meanwhile feature special sensors designed to detect pedestrians in the immediate vicinity of the vehicle, who could potentially step out suddenly into its path. In an ideal configuration, the AEB technology will be complemented by appropriate occupant protection systems. If an impact with an obstacle is unavoidable, these systems can respond by instantly tightening the seatbelts, adjusting the backrests to an upright position and raising lowered head restraints. Finally, AEB retains its ability to intervene even after a collision has taken place. For example if the system is integrated with the airbag control unit, the onboard computer can use the ESC system to automatically stabilize and brake the vehicle following airbag deployment in order to minimize the risk of secondary collisions.